A dish that I picked up in New Orleans that was on the menu at the now no longer Royal Cafe at 700 Royal St. I waitressed there and it holds some of my favourite memories attached to some of my favourite people to come in to my life. I used to ask Chef Johnnie to make me this vegetarian dish and it is one that has stayed with me. 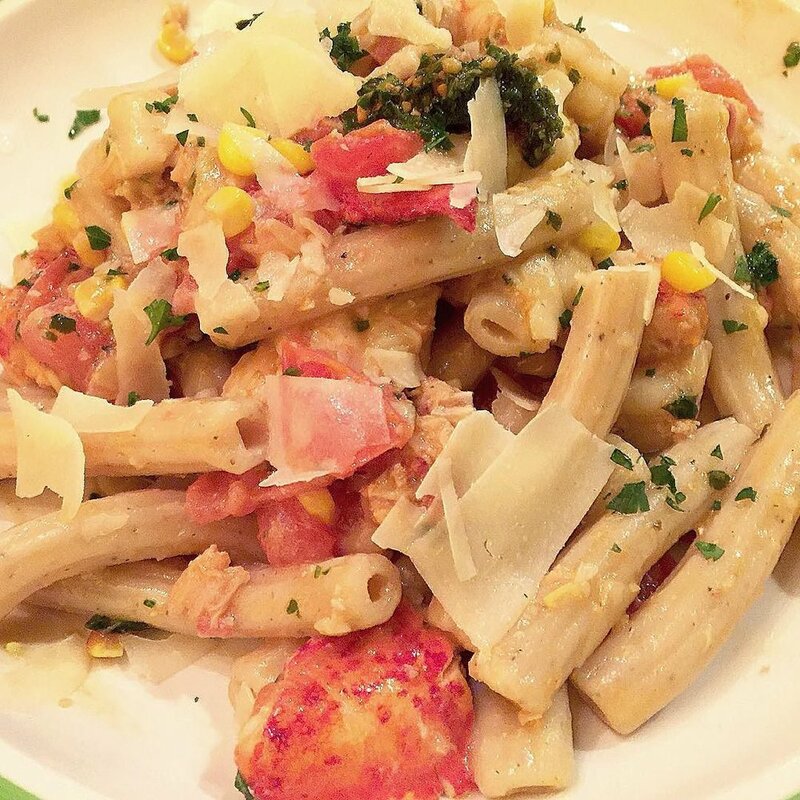 All the flavour of New Orleans in a slightly healthier recipe. 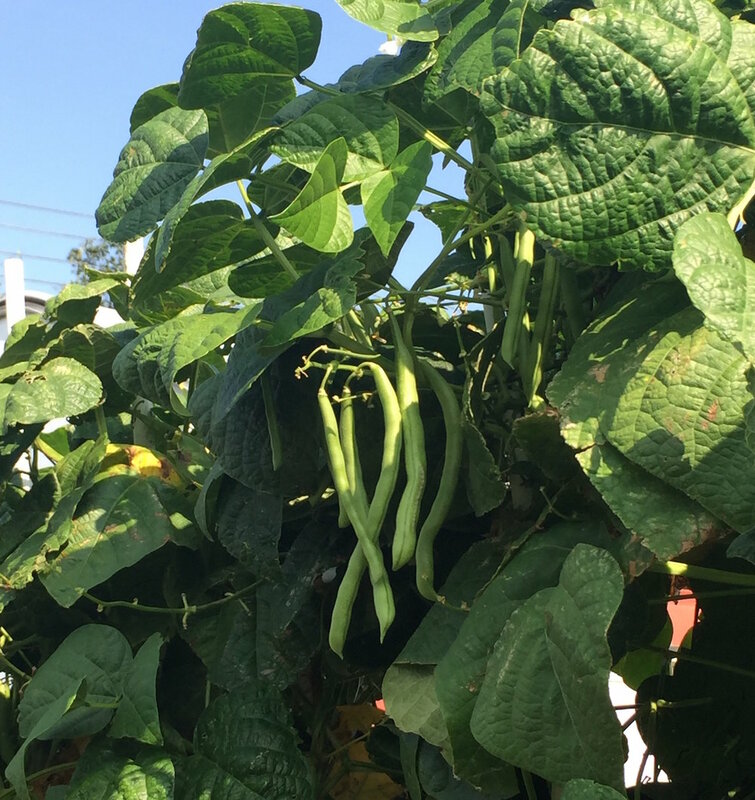 This one combines two of my places I consider home as I used green beans and courgettes that I had picked from my Auntie Chrissie's garden in Orford, Suffolk and brought back to London. It has the cayenne and paprika to give it that characteristically new orleans flavour and is full of vegetable goodness. I love this recipe with any variation of vegetables of with prawns or crawfish. 1. Whilst preparing your veg adn ingredients begin to salt and boil the water for the pasta and cook for the correct time as noted. 2. Add oil to a pan with heat set to low. 3. Heat the sliced garlic for one-minute and be sure not to burn the garlic them remove the garlic slices from the oil and pan. 4. 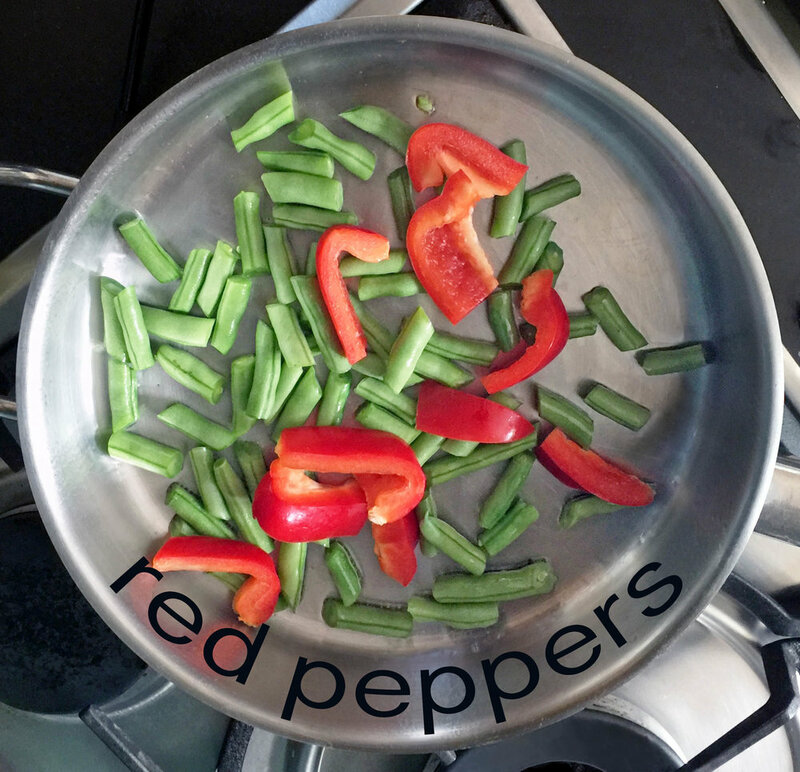 Add the green beans and red peppers to the oil. 5. Add the courgettes and sun-dried tomato to the pan. 6. Add the artichoke, cayenne and paprika to the pan and stir well. If you do not like spicy food then you should reduce the cayenne and paprika from 1 teaspoon to 1/2 teaspoon. If you prefer spicy dishes you can increase the amount of cayenne and paprika to 1 tablespoon each of cayenne and paprika. 7. Add the thyme and cream to the pan and stir well. 8. Drain and add the pasta to the pan, stir well, garnish with oil and parmesan if so desired and enjoy! Here is a fifteen second video of my first attempt at making spelt spaghetti. 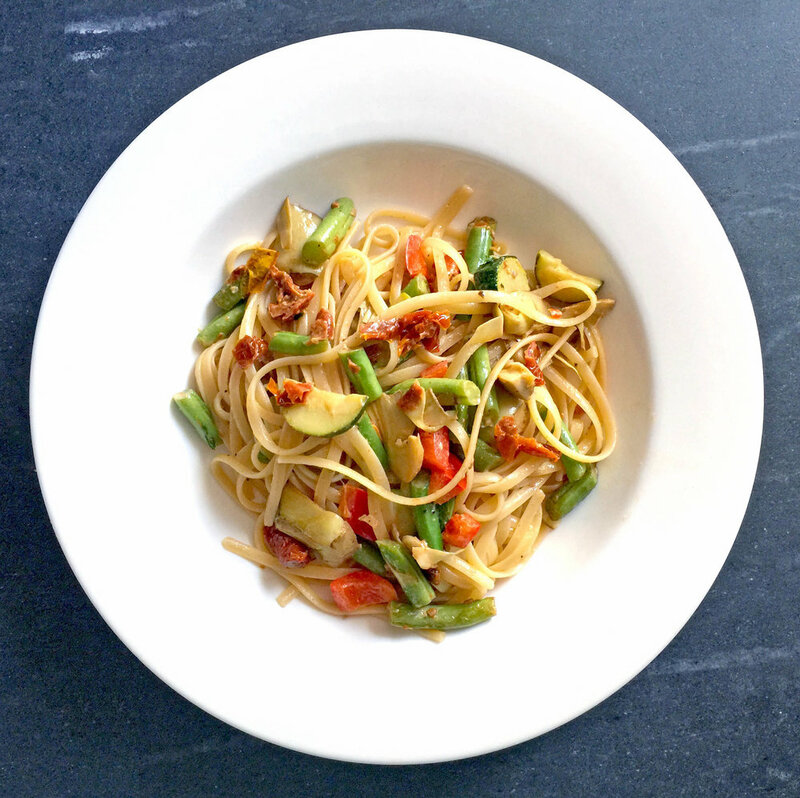 Check out my spelt pasta blog post for the spelt pasta recipe. The spaghetti was the inspiration for the above print painting that I made. *For this recipe I used handmade spelt spaghetti using the recipe as linked above and using my Imperia pasta maker's spaghetti section. The section needed to be cleaned between each passing of the pasta sheets as little bits were getting stuck in the grooves which turn the sheets into spaghetti which was making the spaghetti sort of twisted and broken. I cooked my spaghetti for about 7 minutes which was much longer than the 4 minutes that I needed with my spelt fettucine that I made. I think this was due to me having left the fettucine to dry out longer than I had with the spaghetti. The resulting recipe was hearty but not overly heavy, this is probably down to the spelt flour. With each bite I was able to taste the ingredients of the pasta and the flavours of the sauce. I find I'm eating less pasta now that I'm hand making it but the levels of flavour make it much more of an enjoyable pleasure. Next up will be lasagna but for now the recipe for the spelt spaghetti and tomato sauce with bacon and red peppers. Chop and lightly fry the bacon in your preferred oil and cook for 5-7 minutes without browning or burning. Add the garlic, shallot and chilli and cook gently for 3-5 minutes, stirring constantly so that they do not burn. Add in the tomatoes, salt and pepper, turn the heat up to meduium hot and stir thoroughly until everything is bubbling away nicely. Cook for 5 minutes then place a lid over the sauce, reduce the heat to low and leave to cook for at least 45 minutes, checking occassionally that it is not drying out. If it is drying out you can add 75ml of water, stir it in and continue to cook. Cook your pasta and once ready and drained stir the sauce into the pasta until it is evenly dispersed, top with parmesan and serve. I found this Imperia Lusso pasta maker in a charity shop for £6 and immediately bought it. I have made pasta before with a pasta machine I bought fifteen years ago but I ended up using it only for work with polymer clay so when I saw this Imperia I was excited to get back into the pasta making game. I am addicted to podcasts and one of my favourite EVER podcasts is Ronna and Beverly, two outspoken fiftysomethings from Boston, who can be seen regularly at the Upright Citizens Brigade Theatre in LA, dispense their unique brand of relationship advice while interviewing/interrogating celebrity guests. This podcast is hilarious and I particularly love lots of their little reference and phrases as I spent a large chunk of my life in Plymouth, Massachusetts. They are also huge anglophiles and even had a series on Sky and perform in London lots and I only hope they come back here soon. They are always great company and were especially so during the making of my ragu and pasta. I love spelt flour for bread making and pasta as well. The photo above shows two eggs which Imperia suggests adding to 250g of flour but I opted to add a third egg to help bind the spelt flour which I believe was the right decision. I broke the eggs into the middle of a flour bowl and used a fork to blend and mix the flour into the middle until it was blended and then gave it a light kneading, covered it and left it to rest for an hour. I removed a golf ball sized of dough from the rested dough and then divided the rest into three separate balls. I took the golf ball sized ball and flattened it roughly and passed it through the pasta maker several times to remove any bits of dried dough from within. This was after giving the machine a very thorough cleaning with kitchen towel and olive oil. With each of the three balls I roughly flattened it into a rectangular shape, dusted it with a little bit of flour and started with the widest setting and sent it through. I repeated these steps and decreased the width on the machine stopping at the second to thinnest setting. I then let the long sheets as seen above left to rest for 15 minutes and then I sprinkled them with flour and passed them through the tagilatelle setting and let them dry for about an hour. I brought a big pan of very salted water to the boil and cooked the tagliatelle for 3 minutes. After checking that it was ready I drained and added 3 large serving spoons of my homemade ragu (ragu post coming soon) and mixed this into the pasta. Then I plated up the pasta and added 2 serving spoons of ragu on top of the pasta and drizzled with olive oil and grated with parmagiano. 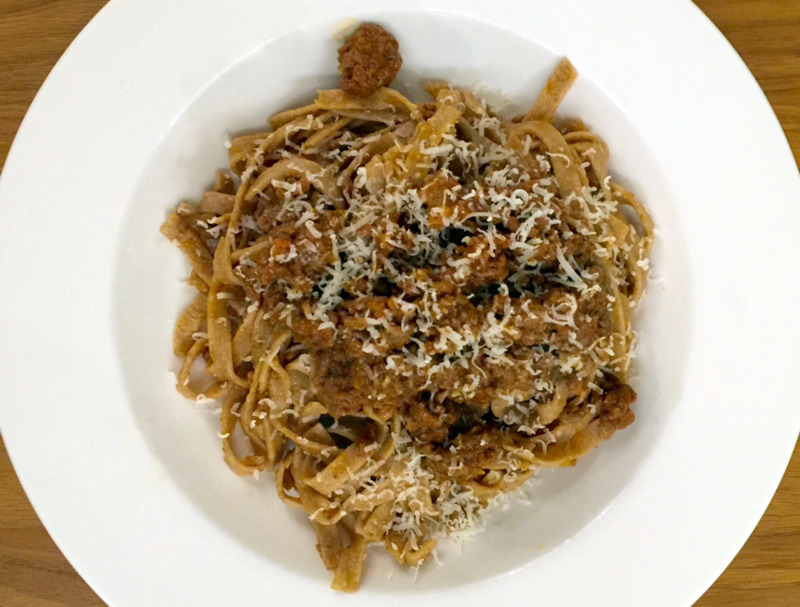 The texture and taste of the pasta combined with the proper ragu made me pledge after the first bite to put the pasta machine to use wherever and whenever possible. Sure it was a bit more effort but it was well worth it.